Hi ladies! I am so excited to help you create your first Wardrobe Capsule! I’m going to share 5 easy steps to design your personalized wardrobe for the Spring and Summer season. 1. Remove from your closet all of the clothing from the past season. 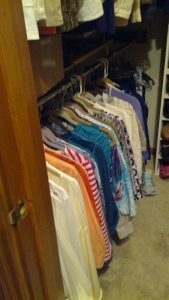 Since most of us have finished Fall and Winter, for which we are very grateful, we will store away these clothes in totes or hang them in another closet. This includes your accessories as well. Now you are ready to work with your Spring and Summer wardrobe. 2. Try on all the remaining pieces in your closet. Check each item for fit, style, the quality, and appearance. For example, Do you have tops that are pilled or faded from washing? Find several totes and label them: Donate, Consign, Too big/ Too small, Fix Me, and Trash. As you try on your clothes sort through them and eliminate all of the unwanted pieces. When you’ve finished this process you should have these items remaining; Tops, Bottoms, Dresses, and Outwear pieces. Find 27 pieces to build your capsule! 3. Find 27 pieces to build your capsule! This is where the FUN begins. Hopefully, you will have 7 bottom pieces (pants, skirts, and jeans) 14 tops (patterns and solids) 3 dresses and 3 outwear pieces. Ladies, keep in mind that these clothes are pieces that you will wear for the majority of your day. Ladies, I am excited to share https://fashionmeetsfaith.mykajabi.com/a/2031/mFVcgvhS with you, where you’ll have the opportunity to go through the process of building your wardrobe capsule with my friend and mentor Shari Braendel. She will show you a live closet edit and walk you through the process using 8 self-paced modules and a worksheet to guide you in determining what you need to shop for to complete your closet. Choose a “POP” color that is complementary to your skin tone, eye color, and hair color. 5. Choose one purse and several other accessories to complete your wardrobe. The best purse color is to match it to your hair color. You’ll always look complete from head to foot! Are you excited to get started! Let’s start with removing all of your clothes from last season, try on everything that’s left, check it for quality, style, and fit, find 27 pieces to build your capsule, choose your “pop” color, one purse and other accessories to complete your look. 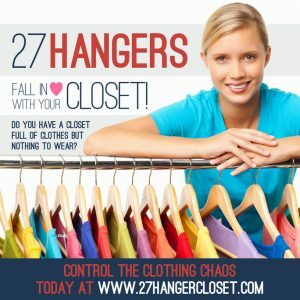 Check out the online Wardrobe Capsule academy at 27 Hangers. 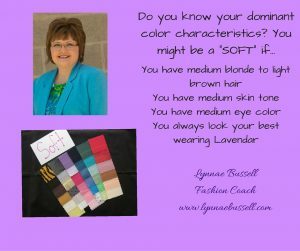 Contact me for your virtual appointment to determine your color code. When you schedule your appointment, be sure to use the coupon code Style 30 before May 1, 2018. I’m definitely going to have to try this. I was just thinking the other day how full my dresser and closet are getting, and I don’t wear a lot of the things in them. This idea may motivate me to clean out! for you that you might like!